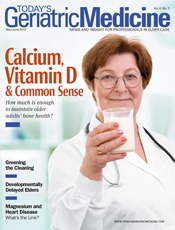 Calcium and vitamin D are essential for older adults’ bone health, but how much is enough? Confused about calcium and vitamin D? You’re not alone. The recent media coverage on the topic has created a tremendous amount of confusion among health care providers and patients alike. Unfortunately, this coverage may be counterproductive to providers’ attempts to promote adequate calcium and vitamin D intake for bone health. By thinking they aren’t needed, patients are jumping to the wrong conclusion. In response to the “calcium craze” in the 1980s, Robert P. Heaney, MD, a distinguished professor at Creighton University in Omaha, Nebraska, and an expert in calcium nutrition and bone biology, published the consumer-aimed book Calcium and Common Sense in 1988. Taking the lead from his book and updating the title, let’s look at the facts and controversies. Compared with many other issues we face in medicine today, the essential nutrients calcium and vitamin D seem to be simple topics. Our bodies do not make calcium, so we need to take it in each day. In contrast, our bodies do make vitamin D. However, the skin’s vitamin D production is not assured. Enough ultraviolet radiation of certain wavelength must be absorbed by enough surface area of unprotected skin for enough time to convert the precursor of vitamin D and start the cascade to produce active vitamin D. The season, geographic location, time of day, skin color, sunscreen, body size, age, and liver or kidney problems may all play havoc with active vitamin D production. Vitamin D is the “what’s in” vitamin of this decade. For a while it seemed that a new research discovery about vitamin D and chronic diseases or acute illnesses was being made each week. Many research findings for areas outside of bone and muscle have been observational ones that do not prove cause and effect. However, sufficient clinical trial evidence has proven efficacy in the area of musculoskeletal health for the need of adequate calcium and vitamin D.
In 2010, the Institute of Medicine (IOM) Committee to Review Dietary Reference Intakes for Vitamin D and Calcium based their recommendations for these nutrients on musculoskeletal health, not other health issues, because of the weight of the evidence for only the former. Their recommendations for vitamin D intake for public health policy, not at-risk groups, were not well received by the medical and scientific community. The updated vitamin D Dietary Reference Intakes were based on the vitamin D level of 20 ng/mL. Debate continues over the minimum 25-hydroxyvitamin D level of 20 vs. 30 ng/mL. Recommendations on vitamin D intake have come from various national and international organizations before and after the 2010 IOM updated intakes. The recommended IOM values work as a whole for a public health message but may not necessarily meet individual patients’ specific needs. On the other hand, guidelines from groups such as the Endocrine Society emphasize the care of patients who are at risk of vitamin D deficiency and specify 30 ng/mL as the minimum target level. It’s important to point out that this recommendation does not apply to the treatment of people with osteoporosis or vitamin D deficiency. In addition, the USPSTF does not directly comment on high-risk elderly and those living in assisted-living or skilled nursing facilities, even though those studies were evaluated. The USPSTF examined a total of 16 randomized controlled trials that had fracture outcomes using vitamin D alone or with calcium supplementation. The committee considered only six randomized trials in the community setting evaluating the use of calcium and vitamin D supplementation for the primary prevention of fractures. They found no fracture reduction in community-dwelling individuals. The results are heavily weighted by the largest trial, the Women’s Health Initiative (WHI). To review, the WHI Calcium Plus Vitamin D Trial included more than 36,000 women aged 50 to 79 at the start of the study. Participants were randomly assigned to take 1,000 mg of calcium with 400 IU of vitamin D3 daily or placebo pills. At the end of seven years, the number of fractures was similar in each group; calcium plus vitamin D did not reduce fractures. However, those headlines missed one paragraph in the WHI results. A separate analysis was done of only the women who were actually taking their assigned study pills. If they had taken their pills 80% of the time or more, their risk of hip fracture was reduced by 29%. Several months after the original publication, the WHI authors wrote in The New England Journal of Medicine Letters to the Editor that they believed their data supported the recommendation for adequate calcium and vitamin D intake in postmenopausal women. Also in contrast to other clinical trials, women in the WHI trial were allowed to take their own calcium and vitamin D. Some women also were part of the estrogen studies arm of the WHI, while others were taking their prescription osteoporosis medicine. In other words, the data were extremely messy. It was difficult to dissect the effects of calcium plus vitamin D alone. Nevertheless, the WHI was the only one of the six randomized controlled trials rated as “good quality” by the USPSTF committee, while the others scored “fair” or “poor.” The five other studies in the USPSTF meta-analysis were comprised of small numbers of subjects and had significant limitations in methodology. The USPSTF also evaluated five trials that compared vitamin D alone with placebo or no treatment in community-dwelling (three trials) and institutionalized settings (two trials) and found no fracture reduction. In their evaluation of the evidence, the USPSTF committee used two systematic evidence reviews from the Agency for Healthcare Research and Quality published in 2007 and 2009 and an updated meta-analysis on vitamin D supplementation with or without calcium. The updated meta-analysis for the USPSTF, published in December 2011 in the Annals of Internal Medicine, examined the benefits and harms of vitamin D with or without calcium supplementation on clinical outcomes of cancer and fractures in adults. “Combined vitamin D and calcium supplementation can reduce fracture risk, but the effects may be smaller among community-dwelling older adults than among institutionalized elderly persons. Appropriate dose and dosing regimens, however, require further study,” the authors concluded. Of note, in 2012, a different USPSTF committee found that daily vitamin D supplementation prevented falls in community-dwelling adults aged 65 and older and recommended following the 2010 IOM guidelines. As we are well aware, falls result in broken bones in older patients. Is It a Dose Effect? More meta-analyses have been done on the topic of vitamin D alone or in combination with calcium for fracture prevention than original research studies. Following the USPSTF, lead author Heike Bischoff-Ferrari, MD, MPH, and colleagues, including WHI investigators and investigators from other vitamin D trials, performed a meta-analysis examining the relationship between vitamin D dose and fracture incidence, which was published in July 2012 in The New England Journal of Medicine. Vitamin D supplementation of ≥ 800 IU daily in people aged 65 and older reduced the risk of hip fracture by 30% and the risk of any nonvertebral fracture by 14%. Benefits at this level of vitamin D intake were consistent across subgroups defined by age, type of dwelling, baseline 25-hydroxyvitamin D level, and additional calcium intake. Do vitamin D and calcium reduce the risk of fractures? The evidence is a result of mixing, slicing, and dicing only a few studies that are not well done and are overpowered by the WHI results. The intervention trials divided into low and higher dose supplementation may provide more clinically relevant analysis of the evidence. Additional original research is needed, but it’s doubtful any long-term clinical trial with fracture outcomes will ever be done. The news headlines are conveying the wrong message. Calcium and vitamin D are essential for bone health. The real question is how much is enough? The debate is far from settled regarding the minimum 25-hydroxyvitamin D target level of 20 vs. 30 ng/mL. Identifying the right level for calcium absorption, bone mineral density, muscle strength, and fracture reduction remains controversial. Data suggesting the potential risk of prostate cancer apparently influenced the IOM committee in deciding on the appropriate level coupled with little research evidence using higher daily doses. In high-risk elderly patients, improvement of vitamin D status to prevent falls and fractures far outweighs the potential risk of rarer pancreatic cancer. Results of the Cohort Consortium Vitamin D Pooling Projects of Rarer Cancers reported the risk of pancreatic cancer was doubled (OR = 2.12, 95% CI = 1.23 to 3.64) for those in the highest quintile of vitamin D levels (> 40 ng/mL). This analysis was a pooled nested case-control study of 10 cohorts, including two with evidence of a positive association. When these two studies were removed, the association was no longer significant (OR = 2.23, 95% CI = 0.82 to 6.08). The main limitation of this analysis is the small numbers: only 39 cases are in the > 40 ng/mL group. If identifying the minimum level of vitamin D intake seems difficult, pinpointing the optimal level is an even trickier subject. Practically every tissue in the body uses vitamin D, and it’s difficult to know what may work best for one area and what may not be enough for another. The IOM committee suggests an upper level of 50 ng/mL. Using “reasonable extrapolations” from the data for maximum reduction of multiple diseases, other experts recommend an optimal vitamin D range of 40 to 60 ng/mL. Considering that the typical American’s vitamin D level is much less than 30 ng/mL, this range is a lofty goal. Whether higher is better for health outcomes remains unknown. Laboratories typically list the normal range value for 25-hydroxyvitamin D3 as between 30 and 70 ng/mL. However, variability among laboratories demonstrates the problem: There’s a lack of standardization of categories. Target minimum levels, optimal levels, and normal laboratory ranges will continue to be a source of debate in the medical community, and more research is needed to fill in the knowledge gaps. Some Medicare carriers do not reimburse for a vitamin D blood level testing unless a patient has a diagnosis of osteoporosis or fractures, for instance. In our evidence-based medicine, assessing vitamin D status would be ideal but may not make economic sense. Considering the low cost and safety of supplemental vitamin D in comparison with the high cost of one laboratory test, empiric dosing may be the best use of health care dollars. Patients can safely supplement with vitamin D (up to 4,000 IU daily) without checking and rechecking vitamin D levels. Choosing a dose of at least 800 IU per day is necessary. What is established as public health policy may not apply to an individual patient’s situation. In particular, the latest USPSTF recommendation does not apply to the treatment of people with osteoporosis, vitamin D deficiency, or in institutionalized settings. Even though the studies performed in nursing home settings demonstrate a reduction of fractures, only vitamin D doses of ≥ 800 IU daily provided efficacy. Evidence shows low vitamin D supplementation doses and low achieved vitamin D levels provided no protection from falls or fractures. However, compliant subjects who took supplemental doses and achieved higher vitamin D blood levels did reduce falls and fractures. If sunshine and food sources are not providing adequate vitamin D as observed in the majority of elderly patients, supplementation with vitamin D should be recommended. We also should encourage our older patients to meet the IOM recommended calcium intake of 1,000 to 1,200 mg per day first with food and with supplementation only if needed to reach the target amount. Help your patients sort out what they should be doing to promote their bone health.